Ever wake up in the morning and still feel extremely tired? This is me allllll the time. Well, I just tested out a new app that may help you wake up feeling refreshed! 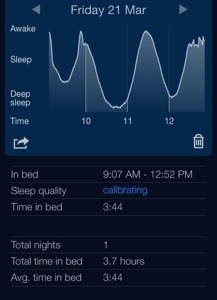 A friend told me about the Sleep Cycle app. You lay it next to your pillow at night and it monitors your movement. It knows when you’re in your deepest sleep and it doesn’t disturb you! Before going to bed, you would set an alarm. I did a test run this morning and set my alarm for 12:30PM. The app schedules that time for 12PM-12:30PM so that during the 30-minute interval, the alarm will go off when you’re making the most movement and not when you’re in a deep sleep! And it worked for me! It also graphs your sleep so you can see what point of the night you were restless and moving around and what point you were deeply sleeping. I love this and I will be using it every night! I have the hardest time getting up in the morning because I’m so tired and my alarm wakes me when I’m still in a deep sleep.